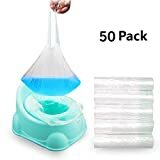 GREAT IDEAL - Are you tired of cleaning the yucky potty chair everyday? Our potty liners with drawstring can perfectly solve your problem. Only need you to knot it and throw into the trash after your baby used it. No more messing! SANITARY - Not only convenient for parent, but also sanitary for your baby. Disposable potty liners avoid your baby touching toilet seat directly, no more infection with bacteria. UNIVERSAL - Bag size 44x24 cm/17.3x9.4 inch, fit most potty seat, also can be used as travel potty bags or potty training bags. Even can be used for dogs and pets poop! DURABLE - Disposable potty liners made of high quality plastic, thick, leakproof, non-toxic, odorless, can hold up to 5 ounces of liquid easily. Light weight and portable to carry on when you on the go. WARRANTY AND SUPPORT - TWOPJ's 7*24 online support standing by, we strongly believes in our products, so we provide you with LIFETIME Warranty.